Finally the first "releasable" version is here. It's a simple app' at the moment, usage should be relatively straightforward. But it should provide it service "as is" : registering your discoveries with comments/image (URL only, try to shrink your images first :p) - and exploring other discoveries, perhaps finding something useful. Note : if needed, I can try to compile for Mac/Linux. I've spoke previously of a community "managed" online database. Well it's not yet online (the db itself), and it's no more a website (my webdesign skills are more than crappy)... So it'll be in Java (no need to cry, I know, it's not the fastest way of handling things :p). -Register / login to the db. Registration is a one step process inside the application (no mail and so on needed)... Password recovery not supported yet But It's on the way. Registered user can insert object or edit their objects. -Add an object (Galaxy - Nebula - Cluster - Star - Planet - Moon - Asteroid) to the database, using a children to parent creation procedure (understand that you can enter a planet and it will create the whole tree to the galaxy if it doesn't exist.) with a pre-filled pattern. I'll post screenshot this evening or tomorrow that'll bring some light on this. -Update an object (observations, image url). 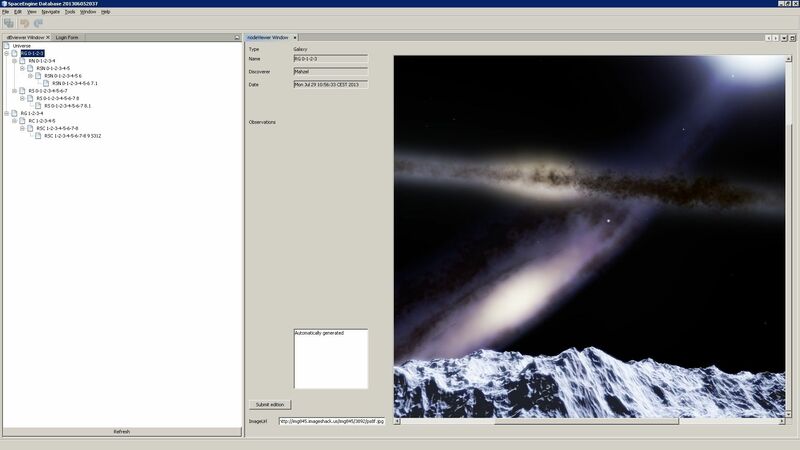 -Display a tree-view (win-explorer like) of the universe. -Handle multiple version. This require some refactor of the db from my side, but is a short term planned feature. So it'll be 0.97 only until done. -More object flags, for easier filters (spectral type, galaxy type, planet type, with life?) - All of those enter in the generic "Observation field"
-Better look of the user interface. It's a bit... grey. -The latest Java Runtime Environment (JRE) at http://www.java.com/en/download/. Well, it's fullscreen because I've resized it for the screenshot ('was a test for the image pane). Default size fits much better with less empty space. The good thing is that it leaves me a lot of space for new functions. The first release will look more like a test release for bug hunting (found three this morning during breakfast). I'll register a dyndns this evening, so I can host the db. I may move on hosted db later on. This'll ensure availability. First test batch released. See first post. Does anyone have any feedback/tested the thing ? It's quite empty after 1 week on the air. If it's platform related I can pack a mac or linux version (but without guarantee as I can't test it before, but it should wprk fine). The development of 1.1 is on its way (filters function and some UI improvments).